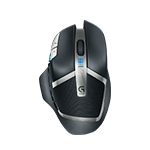 Logitech Gaming Software enables you to program different button configurations for each profile on your computer. To learn how to create and assign application-specific profiles, see article 26855. 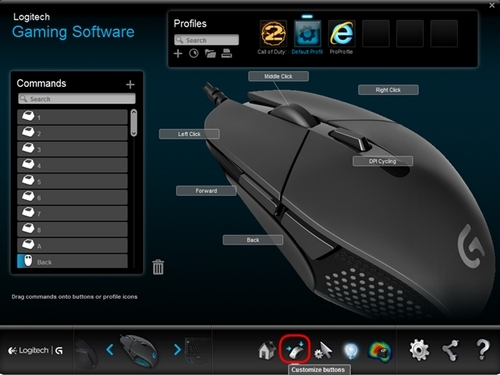 NOTE: If you're new to Logitech Gaming Software or you want to use only one profile with your mouse, first follow the steps in article 26858 to set up your Default Profile as a Persistent Profile. Click the Customize buttons icon. Select the profile you want to edit by clicking its icon. The profile will have a blue highlight bar above it when selected (ex. "Default Profile" below). NOTE: Logitech Gaming Software will detect some games you've installed and create profiles for them. You can create profiles for other games yourself (see article 26855 for help). Drag and drop an existing command onto it. NOTE: All commands you've created for that profile will be visible in the Commands list on the left. When you drag a command over the mouse, the configurable buttons will highlight. Choose the button you want to program and drop the command on top of it. Keystroke — Assign a single key press, or a key press with modifiers. Text Block — Create a block of text to be typed out when the key is pressed (either with or without Unicode support). 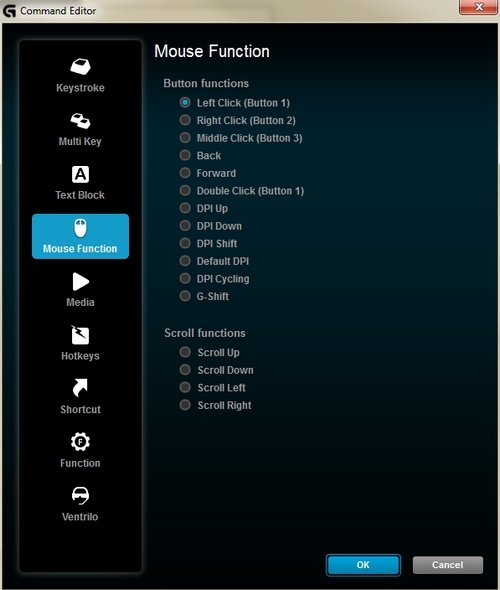 Mouse Functions — Assign a button on your mouse to use any of the available mouse button functions. Media — Set a mouse button to function like a media key you'd typically find on a keyboard. Hotkeys — Use a pre-defined keystroke command. Shortcut — Assign a button to launch a file/folder/drive on your computer. Function — Assign a button to act like a Microsoft function button (ex. to open your web browser). After you've selected the function to assign to the button, click OK. This will apply the new function and you'll the command's name next to the button (ex. 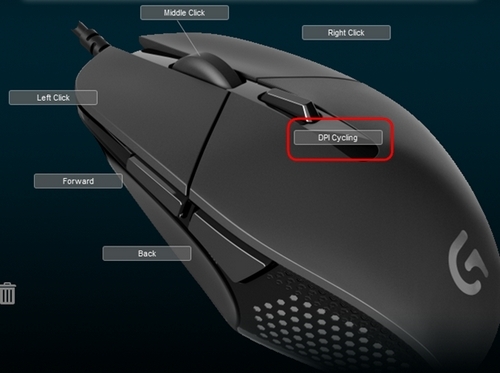 mouse function "DPI Cycling" assigned to Button 5 below). IMPORTANT: At least one button must be configured as "Left Click" and one as "Right Click" at all times. To reprogram either of these buttons, you'll first have to assign that function to another button. To reassign a button back to the standard behavior of the mouse, right-click the button and select "Use Generic". To un-assign a button, either right-click and select "Unassign" or drag the command from the button to the trash icon.